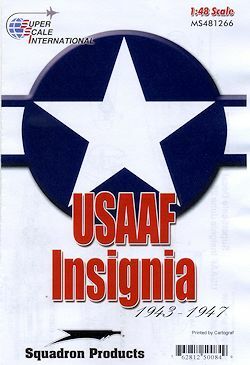 Adding to their US insignia line is this one that ran from September 1943 until mid/late 1947 and is the one most associate with WWII US insignia. Though this one appears to be designed for fighters and USAAF ones, these are applicable to other branches of the service. As mentioned, the instructions just show USAAF fighters. 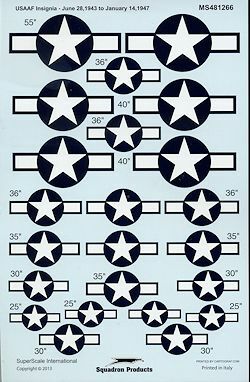 In this case it is the P-38, P-39, P-40, P-47 and P-51.The markings range in size from 25 inches to 55 inches with the big ones designed for the additional underside insignia often used by the P-47. There is a caution that these were just the usual sizes and it was not at all unusual for 'non-standard' sizes to be used. Of course, you can use these on a variety of other types as well. There are placement guides for the fuselage and wings of all the types listed.